With the winter season fast approaching, how do you plan to get the most detailed snowfall information? The easy answer, a SnowREPORT™ providing both detailed snowfall measurements along with a comprehensive meteorological discussion for each winter storm that impacts your city. This service is perfect for both internal record keeping and providing value added information directly to your clients or partners who need verification of snowfall for a given day and time. 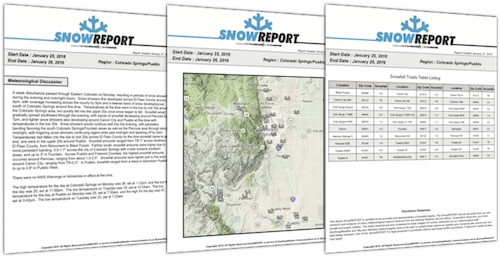 Each SnowREPORT™ is certified to be as accurate and representative of snowfall amounts based on multiple sources, including local ground reports from the National Weather Service (NWS), cooperative observers and other private and public sources. Snow totals are compiled and compared to NEXRAD radar imagery for further verification by in-house meteorologists. No zip code only based reports here, we hunt down as many sources and locations as we can find in your area! In addition to each storm, we can also deliver monthly and end-of-season total snow compilation reports. This service includes the delivery of a PDF report to your email with both a snow total map and text discussion for a given snowfall event delivered within 2-3 business days after snow ends. In addition, you’ll enjoy online access to your own Weather Portal providing access to each SnowREPORT™ that you purchased along with real-time live radar and we can even add icons of your specific client locations on the map! We offer several options whether you’re looking for a single event or the entire season. Each report covers an entire city region. Never expires, use them when you want! Contact us to pick a snow verification solution.